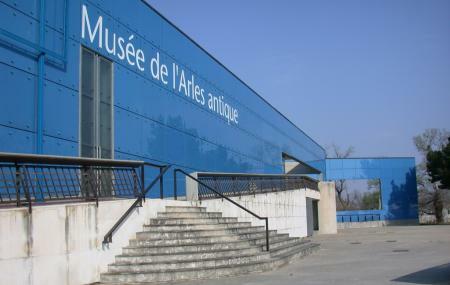 The rich history of the small city of Arles has been remarkably recorded with great care in this famous museum. Built in 1995, the modern and lovely cobalt-blue building of the museum is a beauty in itself. It stands proudly at the edge of what used to be the Roman Chariot Racing Track. The Musee de l'Arles et de la Provence Antique is home to a number of striking Roman sculptures and a large collection of other antiquities. The museum also houses a huge compilation of Christian and Pagan art. This compilation includes absolutely stunning mosaics. A major attraction at the museum these days is the recently discovered ancient boat, known as the Arles Rhone 3, which is known to be about 2000 years old. The museum provides a wonderful view of the Chariot Track and the shape of the museum. Chronologically, running from Prehistory, 2500 B.C. situated at the entrance stretching to the end of Antiquity, 6th century towards the exit. Thematically, corresponding to the characteristics of the museum's various collections such as daily life, trade, the economy, embellishments. Preserving history with great charm seems to be the style of Musee de l'Arles et de la Provence Antique which the elegant and spacious building seems to follow through and through. Free admission for under 18. How popular is Musee De L'arles Et De La Provence Antique? People normally club together Theatre Antique D'arles and Espace Van Gogh while planning their visit to Musee De L'arles Et De La Provence Antique. A museum which seemed to have a nice collection but didn't want to share it with non-french speakers. That is certainly their right. Our only response is not to go and pay their admission. I wish I had followed my own advise. The museum is good and can see they put a lots of efforts in it especially the good job on the boat! However, it could be much better if they can put “English” for the explanations and not merely French.. we didn’t learn anything from the museum except the movie has English subtitles..
Nice simple museum which was not crowded so can take your time to visit. Good way to get a historical overview of this specific city and region. An absolutely superb museum, we were fascinated by the range and type of exhibits, which are well laid out and with clear information. The Roman boat, recovered from the mud of the river Rhone nearby was a particular favourite. There are also well-reconstructed mosaics and a huge number of sarcophagi The building is modern and spacious, so even though we were on a day when entry was free we did not feel crowded. Highly recommended to anyone who is even remotely interested in the times around the Roman period in Provence. Beautifully curated and laid out. My favourite area was the ship raised from the bottom of the Rhone together with all the amazing artefacts found in the silt - glassware, jewellery, amphorae etc. Also loved the spaciousness of the exhibition that allowed you to wander among the exhibits and gasp in awe. Another highlight is the museum garden that houses loads of information about the Roman attitude to gardening and outdoor leisure.